I take it as an indication of the quality of 2013’s games that BioShock Infinite, a game that seemed a shoo-in for copious awards come this point in the year, now looks likely to be frequently overlooked. I’m kind of the same now that the lustre has worn off and the rough edges – prosaic shooting, an occasionally annoying AI companion, bullet sponge enemies, that boss – have become evident. But the original BioShock did very little… original, gameplay-wise. 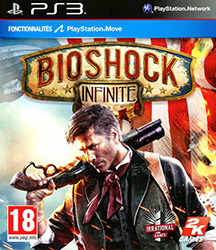 That achieved its plaudits through its setting and story, and while Infinite’s Columbia doesn’t grab me as firmly as the glorious Rapture and its rug pulls can’t touch BioShock’s, I played through the whole thing in two sittings because it kept me enthralled, keen to see what it would do next. The pre-release hype hinted at parallel universes and time travel, but it still surprised me in how quickly and to what extent it ran with those themes. Just imagine the praise that would be heaped on its shenanigans had it been a Christopher Nolan film, say. Gaming as a mature storytelling medium? Never in doubt.